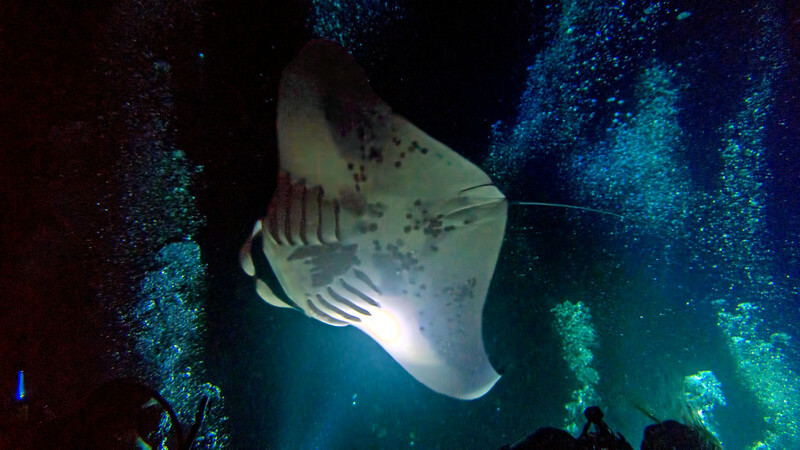 Divers' lights attract plankton, a favorite food for mantas. Having done this dive before, I knew it was critical to find an anchor point on the bottom. I planted myself in a prone position, grabbed a boulder with both arms while attempting to balance my camera in front of me, and hoped for the best. My video light packs a lot of punch in a small package. Apparently it was a beacon for plankton because for the entire dive, mantas swam up to me, over me, and without warning, from behind me. Their wings are so powerful that twice their wake picked me up to a near standing position. During my two other manta dives, there were moments when the mantas swam to the surface, or to other divers, but on this one, mantas were in our faces for the entire dive. Lots of rocking and rolling on the bottom.